Introduction to "The Duston Family"
From the start, Hawthorne found himself struggling to produce material to fill the pages of the magazine. With little assistance from the company, he was forced to supply and edit nearly all of the content himself. He wrote biographical sketches and brief essays on history, geography, science, and the arts. He summarized information from a wide range of published sources, often including amusing topics and anecdotes, such as, "The Science of Noses," "The Uses of Dead Animals," and "The [Spontaneous] Combustion of a Professor of Mathematics." To meet the considerable monthly quota for the magazine, he often resorted to reprinting excerpts of essays or poetry from American and English books. Unable to afford or acquire company funds for a membership at the Boston Athenaeum, Hawthorne relied upon the assistance of his sister Elizabeth in Salem, who responded to his frenzied letters for help by sending him quotations and summaries from books in the Salem Athenaeum.2 "Concoct, concoct, concoct," he wrote her. "I make nothing of writing a history or biography before dinner. Do you the same." Along with locating and composing brief articles of "useful and entertaining" knowledge, the Bewick Company officials required Hawthorne to write commentaries or sketches to complement the wood engravings they wished to highlight. These illustrations were often selected at the last minute and with little or no regard for Hawthorne's opinion. The quality often varied. Samuel Goodrich, who had published some of Hawthorne's first short stories in The Token, was a stockholder and director in the Bewick Company. According to B. Bernard Cohen, Goodrich's principal interest was in promoting the work of engravers.3 Cohen indicates that it was probably Goodrich who provided the engraving shown on the top of this page and asked Hawthorne to write a complementary piece for the magazine. In any case, "The Duston Family" sketch, inspired by the engraving, appeared with the print in the May 1836 issue of the American Magazine of Useful and Entertaining Knowledge. 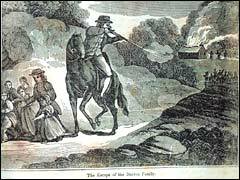 The engraving entitled "The Escape of the Duston Family" was a larger version of a similar engraving first published in Samuel G. Goodrich's Peter Parley's Method of Telling about the History of the World to Children (1832). While composing his Duston Family sketch, Hawthorne drew upon Peter Parley's Method and borrowed specifics from B. L. Mirick's The History of Haverhill, Massachusetts (1832) and Cotton Mather's Puritan history, Magnalia Christi Americana (1702).4 These works related the dramatic experiences of Thomas Duston and Hannah, his wife. Before leaving with her companions, Hannah insisted that the three scalp the dead Indians as proof of their accomplishment. Upon their return to the English settlements, Duston, Neff, and Leonardson received high praises and a generous payment for the ten scalps. 6 Hannah was viewed as a frontier hero, and her story soon entered into American folklore. In his letters to his sisters, however, Hawthorne expressed little satisfaction with his writing or his position. He complained to Louisa, "I am so busy with agents, clerks, engravers, stereotype printers, devils-and the devil knows what all-that I have not much time to write." In a letter to Elizabeth he declared that his contributions to the magazine were "bad enough to satisfy anybody," and added apologetically, "I can't help it." It is proper to remark that we have not had full controul over the contents of the Magazine; inasmuch as the embellishments have chiefly been selected by the executive officers of the Boston Bewick Company, or by the engravers themselves; and our humble duty has consisted merely in preparing the literary illustrations. In some few cases, perhaps, the interests of the work might have been promoted by allowing the Editor the privilege of a veto, at least, on all engravings which were to be presented to the Public under his auspices, and for which his taste and judgment would inevitably be held responsible. "The Duston Family" sketch is not one of Hawthorne's most accomplished works, but it reveals something of the moral imagination of its author. The Duston captivity story-and its subsequent transformations in American lore and literature-must have intrigued the young Hawthorne who was discovering in his native history the subjects and themes for some of his best writing. Given his particular interests in moral conflicts and Puritan bigotry, it's easy to see why his Duston sketch turned out as it did. His judgement in "The Duston Family" is noticeably clear: The Indians are victims and Thomas Duston is the real hero. Hannah is the avenging mastermind, a "raging tigress!" driven to heartlessness and murder by the darker impulses of human nature. This, of course, would be the subject Hawthorne would explore repeatedly in his greatest literary achievements. 1. The Boston Bewick Company, no. 47 Court Street, was an association of authors, artists, printers, and bookbinders. The American Magazine of Useful and Entertaining Knowledge (1834-1837) was founded by Freeman Hunt of Quincy, MA. Numbers 7-12 (Mar. 1836 - Aug. 1836) of Volume 2 of the magazine were edited anonymously by Nathaniel Hawthorne with the assistance of his sister Elizabeth. 2. Elizabeth Manning Hawthorne (b.1802, d.1883). Hawthorne also relied on his sister's assistance when he contributed to Samuel G. Goodrich's children's book Peter Parley's Universal History (1837). 3. B. Bernard Cohen, "The Composition of Hawthorne's 'The Duston Family,'" The New England Quarterly 21 (1948): 236-241. 4. The Duston story was first presented in Cotton Mather's sermon Humiliations followed by Deliverances (1697) then in Decennium Luctuosum (1702), and finally in Magnalia Christi American (1702). The name has several spellings: Duston, Dustun, Dustin, Dustan. 5. The Duston house was the first to be attacked in this raid, located on the northwesterly edge of the settlement. Thomas Duston and his seven children escaped to safety in one of the six garrison houses in the town. The island in the Merrimac is, according to tradition, Contoocook, sometimes called Dustin Island in Boscawen, NH. Of the ten Indians killed by Hannah and her two companions, six were children and two were adult women. Only two Indians escaped alive: a young boy and a woman who was badly wounded. 6. Though the bounty on Indian scalps had expired, the Province of Massachusetts Bay-in agreement with public support--awarded £25 to Hannah and £12 10s. each to Mary Neff and Samuel Leonardson. The Dustons may have received more money to compensate Thomas, the actual petitioner to the court, for the loss of "his estate" to fire during the Haverhill Indian raid. 9. Arlin Turner, ed., Hawthorne as Editor (Baton Rouge: Louisiana State UP, 1941). 10. Henry James, Nathaniel Hawthorne, ed. Dan McCall (Ithaca: Cornell UP, 1998). 11. Turner, Hawthorne as Editor.